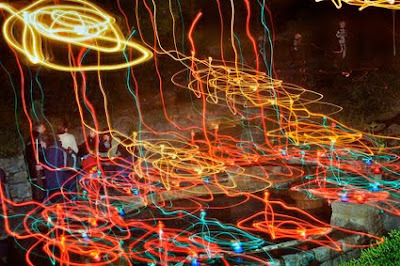 The amazing photo above, called Skeletons, Samhain, Chalice Well, Glastonbury, 2007, is by Sara Hannant. It is part of an exhibition called Collective Observations: Folklore and Photography from Benjamin Stone to Flickr, which is on at the Towner Gallery in Eastbourne, Sussex, from 13 October to 6 January 2013. What's more, it is a free event. Sara, who is the author of Mummers, Maypoles and Milkmaids: A Journey Through the English Ritual Year, emailed me to let me know about the exhibition, and said: "I have several photographs of seasonal rites in this show including images of Samhain, Winter and Summer Solstices, wassailing and Sussex Bonfire Societies." This new exhibition explores the relationship between photography and folklore. It features pictures from Faye Claridge, Matthew Cowan, Doc Rowe, the Benjamin Stone Collection, Homer Sykes, Brian Shuel, Tom Chick, David Ellison and Henry Bourne as well Sara Hannant. It is curated by the Museum of British Folklore in conjunction with the Towner.